‘Condition’ is a term used to describe muscle development but unfortunately, many people get confused about the difference between good muscle tone and fat. Muscle develops as a result of work, and fat develops due to excessive calorie intake. We cannot change fat into muscle as they are completely different tissues. By exercising, a horse will burn fat and build muscle and this is why some people mistakenly believe that fat can be turned into muscle. Remember calories are energy and energy is calories. If you feed your slightly overweight, laid-back horse more calories than he requires, it won’t give him any more energy, in fact it will result in him gaining even more weight as fat and probably make him even more lethargic. 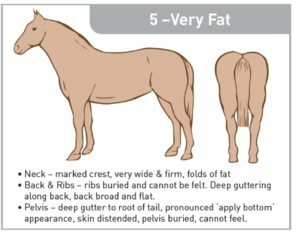 Examining your horse’s body condition can be quite subjective; your idea of ‘thin or fat’ may be quite different to someone else’s. For this reason a system known as body condition scoring, sometimes referred to as ‘fat scoring’, has been developed. 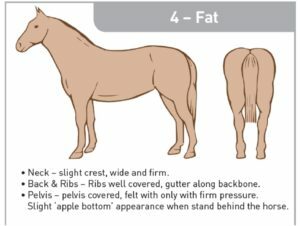 This provides us with a simple, repeatable and consistent way of monitoring the amount of fat a horse is carrying and helps us to differentiate between muscle development and fat accumulation. 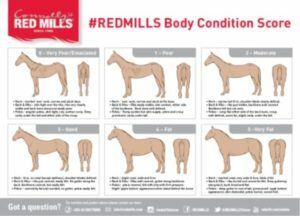 When evaluating your horse’s body condition score, remember to feel your horse’s body, get hands on! Looks can be misleading – thick, woolly winter coats or heavy rugs can often hide weight loss, and you don’t want to be surprised when your horse sheds its winter coat in the spring. 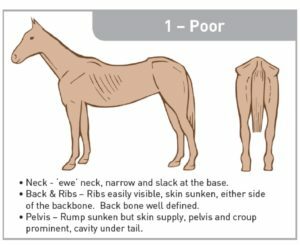 Interestingly, 60% of people’s visual assessment of their horse’s body condition score is different to their ‘hands on’ score. 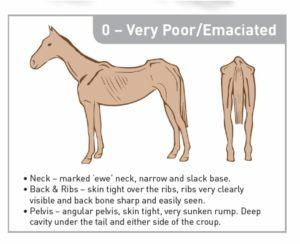 For owners, who see their horses regularly, it’s not always easy to notice slight changes in body condition. 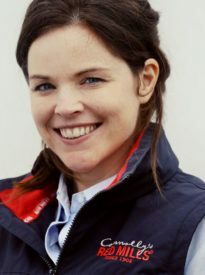 However, body condition scoring your horse every 2 weeks and keeping a record of the results can help you to track any changes and, if needed, adjust your horse’s diet. Given each area a separate score out of 0 (emaciated) to 5 (obese), half points can also be awarded to provide increased accuracy. The average score from all 3 section give you an overall body condition score. However if one area is considerably different to another it is important to note this as it may indicate a potential concern. 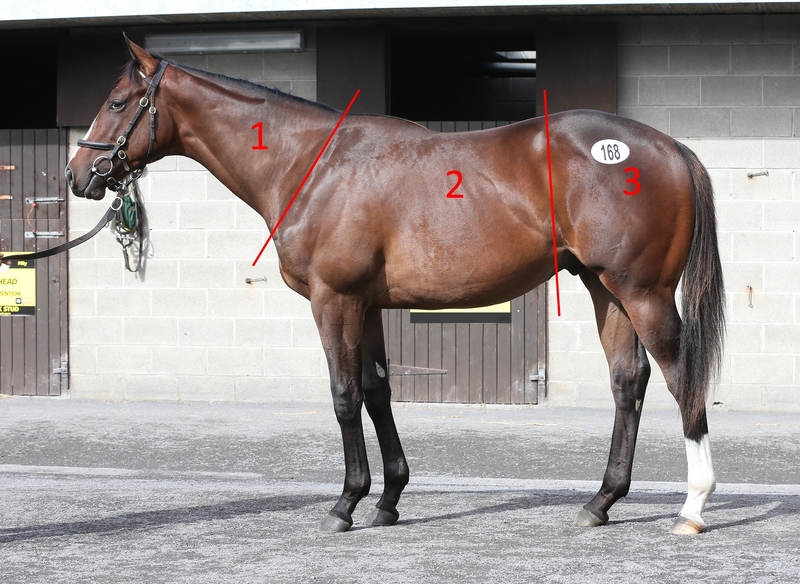 For example, a cresty neck is often associated with an increased risk of insulin resistance and laminitis. 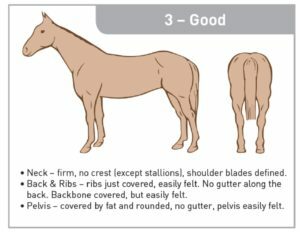 Ideally, your horse should have a BCS of between 2-3 out of five depending on their level of fitness. 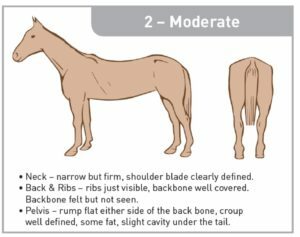 Body Condition Scoring and differentiating between fat and muscle can take a little practise, so download our detailed Body Condition Score Guide and try to BCS as many different horses as you can! Neck – ‘ewe’ neck, narrow and slack at the base.